Donington - bit of a disappointment. A stoppage in the middle of qualifying meant I got no decent laps in, and ended up way, way down the grid in 18th place. Then, come the race, we make it through just one corner before a pileup finds Martin Kay concertinaed into my pristine rear end. Car was OK to drive, so I rejoined, but couldn't achieve better than 12th place from there. Then in the second race, we're heading into the chicane, but there's three people trying to get through in front of me. I back off a bit so I don't end up in the middle of any wreckage, only to find Martin Colier has no such worries. A screech of brakes and ANOTHER thump up the rear end. So the car's gone back to Bish's workshop for repair before the next round at Brands. Stickered up and ready to go. Could do with some proper numbers, though. I chose 117 because it was easy to do with gaffa tape, but seems a cheapo way of doing it after all that expense! McMillan did a checkover and flat-floor setup for me. So now everything on my whiteboard was completed, with the exception of one of the "optional" items - fit new spark plugs. Figured I'd do that just before the first race - might as well have them fresh as possible. 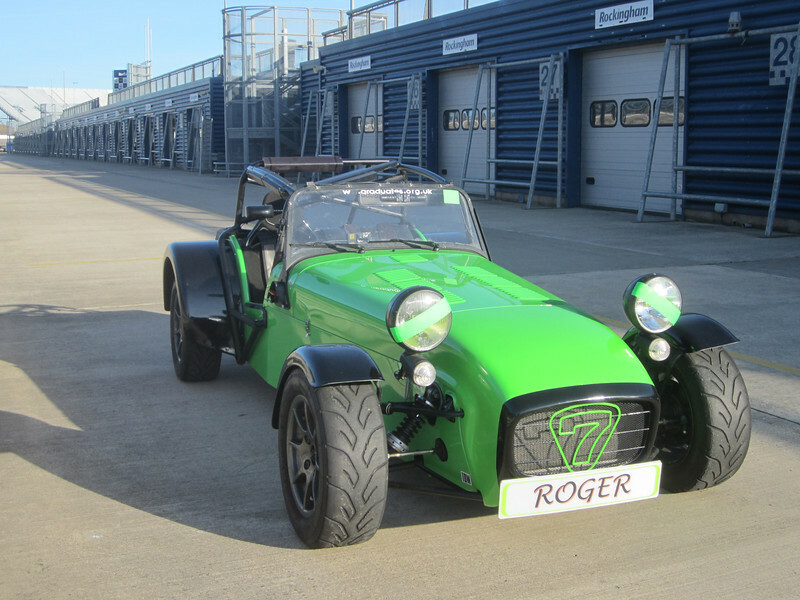 So I headed off to Rockingham for a shake-down track day. Went off for a first lap, darn thing wouldn't rev past 5,000. Can you guess? Yes, the spark plugs were dead. Looks like water got down the plug holes when I was cleaning the engine - a common problem with K's. I replaced the plugs (fortunately I'd already bought the replacements), cleaned up the plug caps, and went off for another lap. No better. Rats. I pull in, thinking it's time to replace the coils and caps as well - but as I pull in it feels just a bit better. So I go out for another lap - and suddenly it's clear. I guess it was flooded from when the old plugs weren't working. And that was the extent of the drama until the end of the day. It was a good day. Unlike most track days, the rules were simply "overtake on the left only". Which meant we were free to overtake in the corners, which avoids the usual track day problem of people in Evos or Porsches who hold you up in the corners then blast away on the straights, only to hold you up again in the next corner. It was open pit-lane, and by around 3:30 I figured I'd had enough - the car was still in one piece and I was starting to get tired. Then I noticed some fluid on my passenger seat. Closer inspection showed it was brake fluid, leaking from my brake bias adjuster (or more correctly: brake proportioning valve). This is an expensive bit of AP Racing kit, and the failure can't really have anything to do with the rebuild. It's the second one I've had too - the first managed to fail in such a way that I had no braking at the rear - I'd wondered why I was having such trouble slowing for the hairpin at Spa! Demon Tweeks will supply a replacement for £170 plus postage, but I really don't want to pay that much. Some wheeling and dealing is called for - but once that's replaced I'm ready to go at Donington on the 30th and 31st of March. 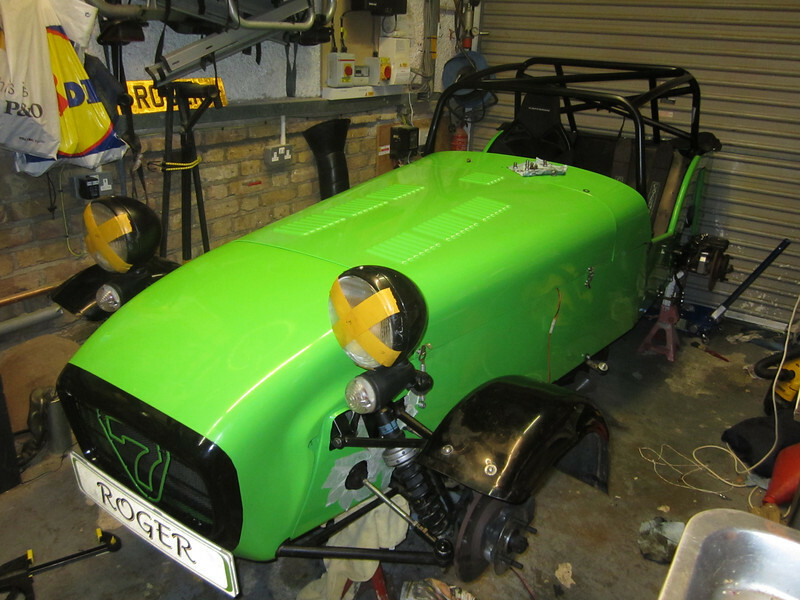 Just the seat and the poppers to sort out now. Nearly there now - really! Some solid work in the last couple of evenings means it's getting very close. The wheels go on tomorrow, then I can drop it down onto the suspension to settle all the bushes before tightening all the suspension up. After that I need to fit the seat. Then it's a matter of fitting all the poppers (for boot cover, tonneau cover and half-doors) and checking for leaks, etc - and it's all done! I know that nosecone looks a completely different colour from the bonnet! In truth, it's a slightly different colour, but this is largely a track of the light, since the nosecone is angled towards us and so reflects more of the ceiling. That's my excuse, anyway. It looks fine in daylight. 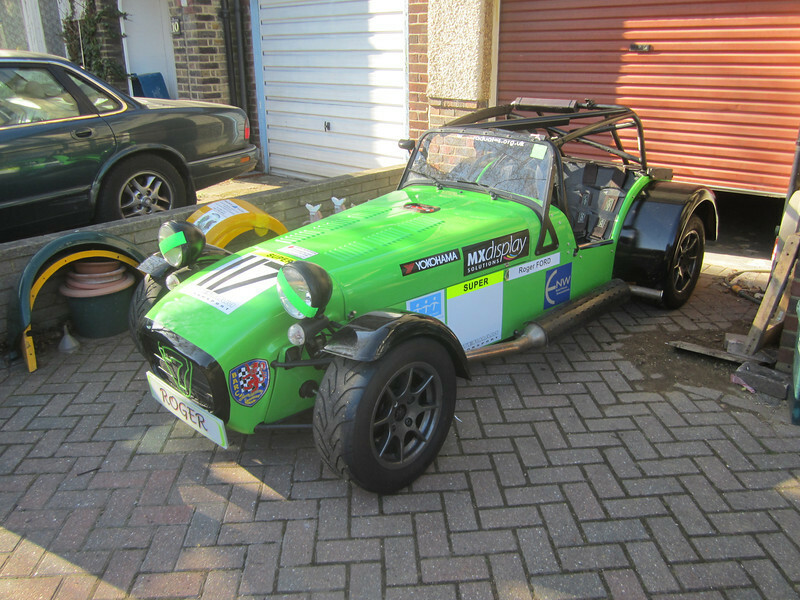 I decided to leave the rear wings for McMillan to fit when it goes in for its pre-season checkover. It's fiddly to get all the rivnuts in the right place, and they have vastly more experience of doing it than I have. I'll get them to fit new front wings as well - the nearside one is bent, and the offside one had a very small crack which gets larger each time I lean on it, and now goes half-way across the wing! 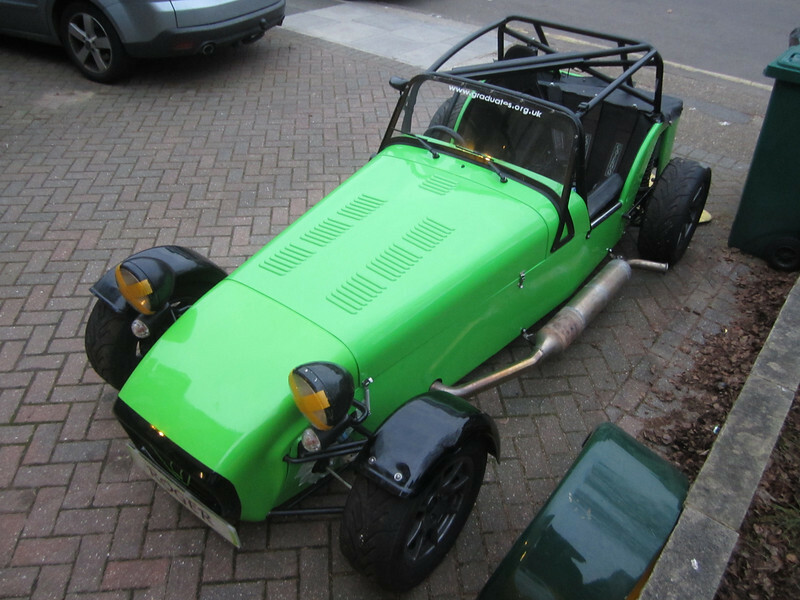 Well, it looks a bit like a car if I put the bonnet and nosecone on, anyway. My white board's got a long list of jobs to do before completion. Each day I cross a couple off, and about add another four that I've just thought of. 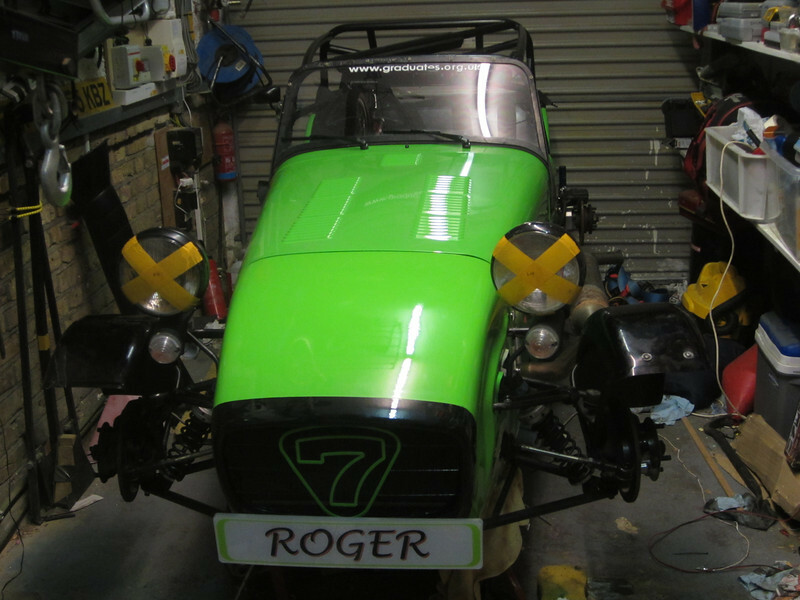 There's a lot of dependencies, and at the moment almost everything is waiting for me to get (1) the cage fitted properly, and (2) the fuel filler. The cage bars need to be spread a bit and pushed down before I can get the front bolts in. The fuel filler is an absolute pig to line up properly with the hole in the rear panel - I think a large amount of brute force and a minimum of mechanical sympathy is needed. Only other major job is fitting the seat. I've finally bought a Tillet rather than creating my own foam or bead seat. Partly because I think it might give better lateral support than the bead seat did (when you're skinny, it's easy to wrap a custom seat round you. When you fill most of the space, it's not so easy). And partly because I thought it would save time. But it turns out that fitting a Tillet is quite an effort as well. I got it cheap off ebay, if I don't like it I'm sure I can get my money back later. After that, all the jobs are fairly small - there's just a lot of them. At work my department has just been reorganised, so I need to head over to California to meet my new boss and new team members, so that's a couple of weeks removed from the schedule. So I need to get cracking and try to cross off more items from the whiteboard list than I add to it. It's a specialist connector, not something you can get at Polevolt or the like. And that's breaking too close to the connector to easily solder a new bit of wire on. Looks like it's off to ebay to buy either a complete Rover engine harness, from which I can rob the right connector and splice it in, or there's one guy who will sell individual connectors - just waiting to see if the harness he's getting them from is the correct one or not. If all else fails, I can use a couple of 2mm female spade connectors, which seem to fit reasonably well into the other side of the connector, but it's a nasty bodge of a solution. 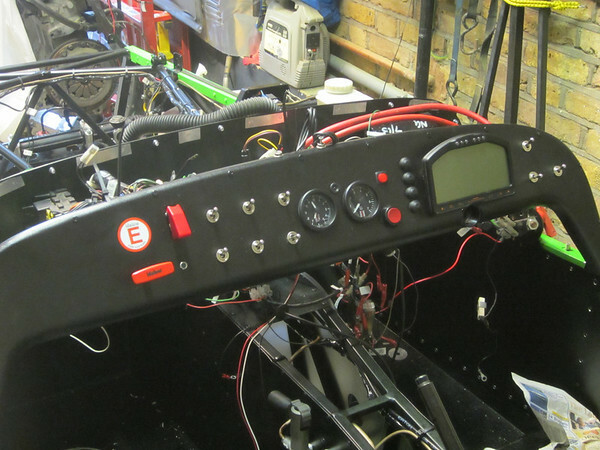 Not a lot of progress over Christmas, I've sorted the new fire extinguisher and all the cabling and hoses for that, but I've been mainly sorting out the electrics and the new dash layout. I'm pleased with it, but it's been a lot of work to get it all wired up properly and working. The Dash2 digital dashboard is mounted on an angled bracket, so it faces directly towards me, and can be slid up and down by half an inch or so for optimum positioning. The other two gauges are a mechanical oil pressure gauge, and a traditional clock (yes, device for telling the time!). The clock had to be wired with a dual supply, so it's powered off a 9V battery when the FIA switch is off, but from the unswitched 12V supply otherwise. Lots of hiccups along the way, mainly due to having to order new connectors and stuff, but also upside-down switches, connectors that mysteriously disconnected during fitting, and me getting the unfused unswitched 12V supply confused with the fused switched 12V supply, and so on. And lots of scary drilling of holes in the dash, the bulkhead and the scuttle. My brother's hopefully coming up again at the weekend. With any luck we'll get the rear suspension all fitted and the engine in. Then it's almost done ... isn't it?